In a recent Westminster Waves interview, Westminster Vice President and Dean of Student Life Bomani Spell discusses the addition of two new Greek organizations planned for the fall of 2018: Zeta Phi Beta Sorority and Omega Psi Phi Fraternity. The groups were founded roughly 100 years ago on the campus of Howard University: Omega Psi Phi in 1911 and Zeta Phi Beta in 1920. Open to any student who wishes to be involved, both organizations are predominately African-American. Listen to the Westminster Waves interview for the complete story. In addition to the 12 male students who petitioned on behalf of Omega Psi Phi, 16 female students signed the petition to bring Zeta Phi Beta to campus. Alumni and faculty reached out as well. 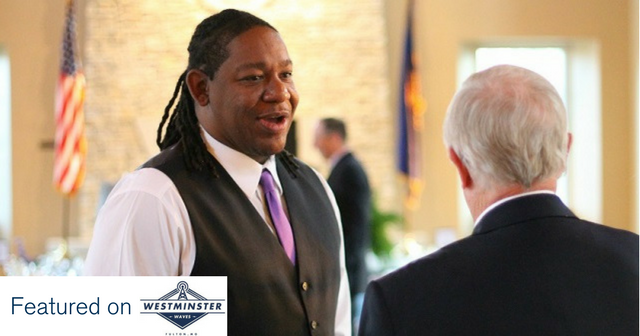 Joe Collier ’01, a member of the Jefferson City graduate chapter who tried to bring Omega Psi Phi to Westminster when he was a student, was excited to help future students get the opportunity. Nicole Elliott, former Director of Campus Life at Westminster, helped guide the students through the petition process. Maj. Gen. (Ret.) Byron Bagby ’78 was also instrumental in bringing the organizations to Westminster. Westminster’s campus is currently 51 percent non-Greek. Although existing sororities and fraternities have done a good job of operating inclusively, Spell says, bringing in Pan-Hellenic (rather than exclusively Panhellenic) organizations such as Omega Psi Phi and Zeta Phi Beta opens the door for legacy students. “These organizations historically have an enclave of a high graduation rate and a high retention rate,” he adds. Another notable aspect of the new Greek groups is that they are citywide organizations rather than campus-wide, which means the fraternity and sorority will also be open to members from William Woods University, as well as graduate members of the community. Community service and mentorship, viewed as central to Pan-Hellenic organizations, will be main areas of focus for both groups at Westminster. Zeta Phi Beta’s graduate chapter in Columbia will actively monitor the younger members at Westminster to ensure that community service hours are met and that the mentorship aspect is achieved. Click here to learn more about Greek life at Westminster. Visit here for more on Omega Psi Phi and here for Zeta Phi Beta. Previous story Coming Soon — Westminster Night at Busch Stadium on May 17!